The prospect of $6 billion in budget cuts to the U.S. Department of Housing and Urban Development. The rolling back of a generation’s work holding local police accountable for the killing of unarmed black men. The use of private prisons within the federal justice system. A secretary of education whose most notable achievement so far is the decimation of public education in Michigan. It describes its measures collectively as a “line in the sand,” marking where things stand at the beginning of Donald Trump’s White House. It’s a mixed picture, no surprise. For African-Americans, slight gains came up in education, health and the economy, accompanied by a comparatively steep drop on the report’s criminal justice indicators. It’s the 13th edition of this data for the comparative state of black versus white Americans. The report measures equality on an index, where the status of white populations represents 100 percent, and black populations’ relative status is expressed as a percentage of the pie. The education boost resulted from a large decline in the share of African-American students who have teachers with fewer than three years of experience. The percentage of African-Americans between 18 and 24 years of age also increased, as did home literacy activities for African-American children. The high school dropout rate also declined among African-Americans since last year’s report. On the economy, gains were driven primarily by continued improvements in black unemployment rates, along with increases in black women’s earnings, a decline in the share of black households with high-price loans, and growth in the percentage of black-owned businesses. On health, the report’s findings include greater black-white equality in terms of Medicaid spending per beneficiary, maternal mortality, children’s access to healthcare, and the share of overweight children between the ages of 6 and 11. 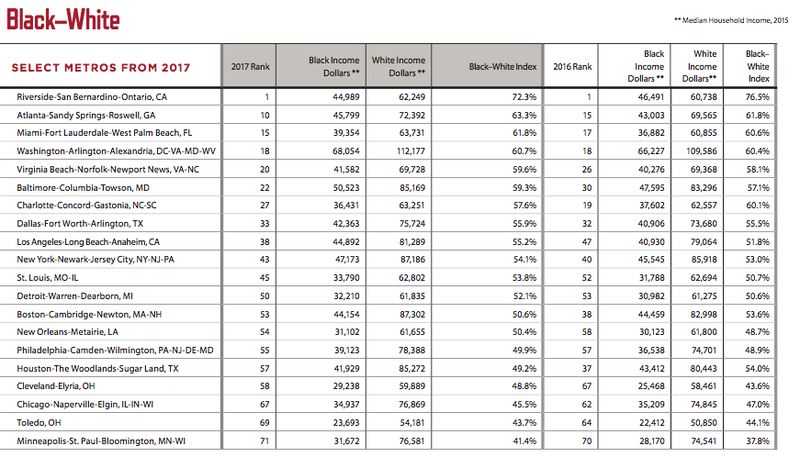 But on criminal justice, measured by the report’s black-white social justice index, the report attributes a comparatively steep decline mostly to a change in how the Office of Justice reports data on traffic stops. African-Americans also experienced an increase in incarceration rates following an arrest. 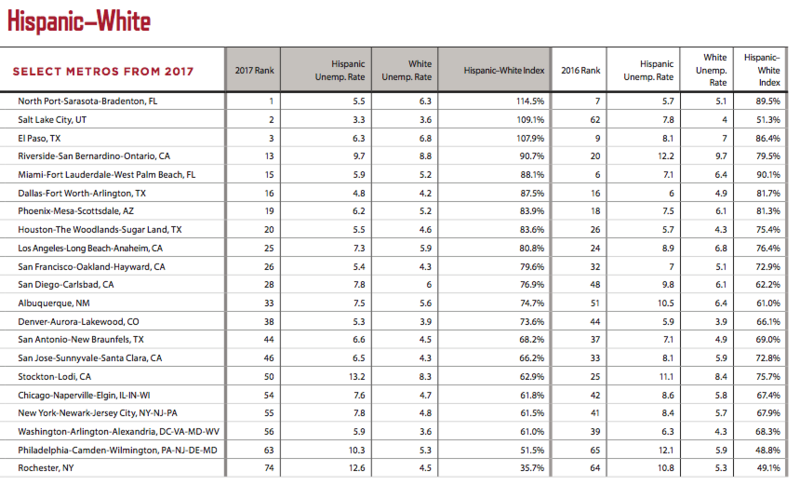 The report features the fourth edition of Hispanic versus white indicators, showing slight gains in economic, health and education indicators, and a comparatively steep drop on criminal justice measures. Hispanic households lost ground relative to whites when it came to incarceration rates, the female homicide rate, victims of violent crimes and high school students carrying weapons on school property. 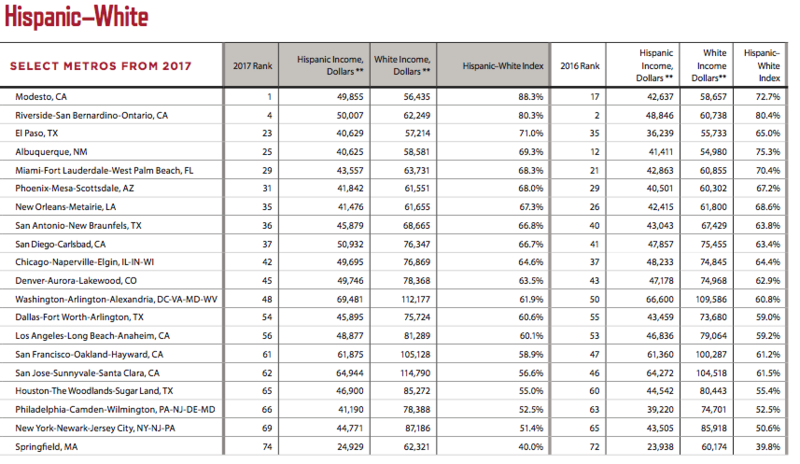 It’s also the fourth year that the report ranked unemployment and income equality among whites, blacks and Hispanics in the nation’s largest metropolitan areas. San Antonio-New Braunfels, Texas, tops the list as the area with the smallest black-white unemployment gap. Milwaukee-Waukesha-West Allis, Wisconsin was the most unequal, with a 13.8 unemployment rate for black workers and only 2.7 percent for white workers. Three notable metros had lower unemployment rates for Hispanic workers versus white workers: North Port-Sarasota-Bradenton, Florida; Salt Lake City, Utah; and El Paso, Texas. 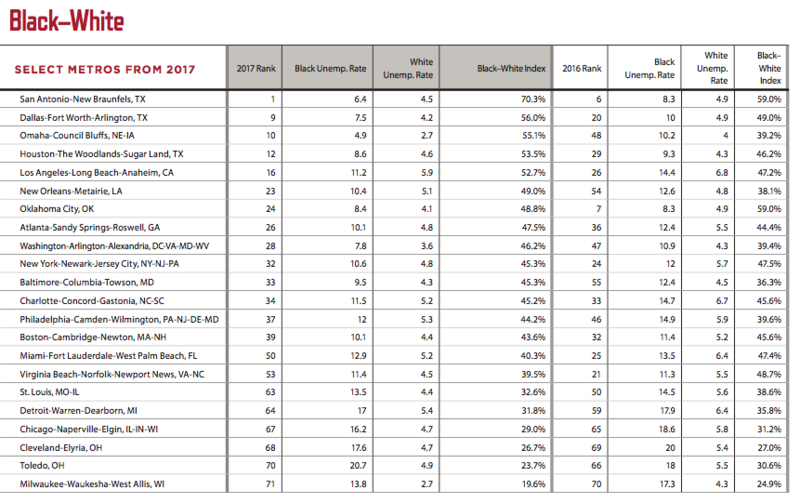 On income inequality, Riverside-San Bernardino-Ontario, California, was number one on black-white income equality for the third consecutive year — even though its equality declined. The median black household in Riverside earned 72 cents for every dollar of median white household income, down from 76 cents last year. The Twin Cities metro was the least equal, with black households earning only 41 cents for every dollar of white household income. Accompanying the report, the National Urban League also announced its “Main Street Marshall Plan” for strategic investment in America’s urban communities. At the annual conference of the National Community Reinvestment Coalition in March, National Urban League President and CEO Marc Morial described the plan as a response to those who would say “I have a plan to fix inner cities.” The plan, he highlighted, has a large focus on inclusive zoning, with a call that any and all subsidies or giveaways to developers should come with requirements for affordable housing.